veganism | upside down again. While I’m thrilled at the awesome reality of the biggest newspaper in the United States running an animal rights story on the front page (I never thought I’d see the day, truth be told), I can’t help but think of lying in my room debating vegetarianism with a jaded ex-vegetarian roommate last semester, who aptly reminded me that veganism was an expensive, bourgeois cause. And while I bitterly fought with her, reminding her that a salad or mashed potatoes was exponentially cheaper than a sirloin, I couldn’t help but agree with her a little in my head. Mr. Gregory is right. Sure, there are a lot of people buying cage-free eggs, and everyone would probably like to be buying cage-free eggs (except the truly heartless, but let’s exclude them from this discussion). Unfortunately, animal rights has become a cause that many well-meaning liberals view as in blatant conflict with many human rights. There are a lot of people who frankly don’t have the means to eat vegan, and that’s a really depressing reality. Our food and agriculture system has grown to be such a divine mess that it’s time the government gets involved. And not in a paltry, ball-less way (The insult that is Nancy Pelosi’s farm bill 2007 doesn’t even come close). We have got to start looking out for the living things that call America home. 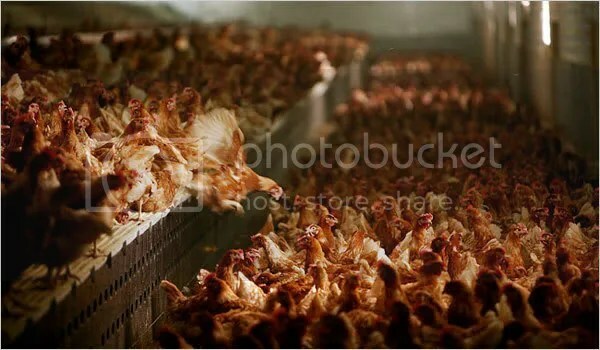 Countries all of the world have animal rights acts in place; Chicago has outlawed foie gras; it’s time for America to step it up and develop comprehensive standards that absolutely must be met so that we can all sleep at night knowing that animals in this country are treated with respect. Fresh produce and local agriculture needs to be made available in lower-income urban areas. In my mind, corporate farming should be illegal. Just imagine how many jobs and how much healthy food would result from a country running on privately-owned and operated farms. No one in America should starve. There’s enough money in the world for every human being to have a million dollars. I know I’m sounding annoyingly idealistic, here… but no one in this country should be starving. That soup kitchens and food pantries across the country are strapped for resources is downright wrong. In the meantime, I’m grateful people are buying the “cage-free” eggs. It’s a good way to start my Sunday. Next time, though I hope the New York Times steps it up a notch and gets their fingers dirty. It’s time to start reporting about animal cruelty — the parts about it no one wants to read. Because then, maybe, they’ll really pay attention. I was at a Christmas party this year where I ran into my high school Chemistry teacher — also the overseer of the school’s “Students for Environmental Action” group. He had brought to the party a home-made spinach and feta quiche, and I have to say, even though I am a stalwart vegan, I was very impressed. However, upon complimenting him on his quiche, my former teacher lamented that he had faced an ethical dilemma while buying the spinach. There were two spinach options at the natural food store he shopped at. One option, at $3.99 a bunch, was an organic brand of spinach which had come from China. The other, at $4.99, was a non-organic brand which had come from upstate, made by a company owned by Nabisco. Which spinach should he buy? He went for the latter because to him, no cause was greater than buying locally (or as locally as possible). There are hundreds of advantages to this: Local food supports American farmers (who really need support as free trade and corporate-controlled agriculture become more and more prevalent), contributes less to global warming (the less your food has to travel, the fewer carbon emissions are made), and is often safer and better for your health (foreign produce, fish and meat have come under investigation recently for spreading various disease). One thing Congress has tried to do about this problem is to institute a country-of-origin labeling (COOL) law, which would require all meat, fish and nuts to be labeled with the country they came from. That way, consumers would be able to decide for themselves (as my old chemistry teacher did) what they put in their mouths (or in their quiches). But, as with most good Congressional ideas, Republican members of Congress (Henry Bonilla especially) have managed to push back the enforcement of this law. For five years. While pocketing enormous sums of money from the livestock industry, who fear higher costs with the instigation of the law. But good news: As we have been witnessing over the last few weeks, the Democrats have finally learned to speak. And the Times says things are looking good for the law these days. They also say it would be difficult and expensive to label ground meat like hamburger, since it often includes meat from different cows. There are just so many things wrong with that. Animal abuse aside (although that’s another horror story in and of itself), worker’s rights are pathetic in slaughterhouses, which means they regularly employ undocumented workers who are subject to frightening racism and bigotry. The work is dangerous, unhealthy and rigorous. Standards are lower, not higher, in countries like China and Mexico. I’m constantly surprised that this system isn’t more thoroughly examined. The meat industry is as corrupt as any other industry in the country — except it alone explicitly abuses the right every living being should have: basic respect.